whatever committee it is out there that bestows these types of honors, i submit this for your approval: my doctoral sewing thesis. i am ready for my black belt now. 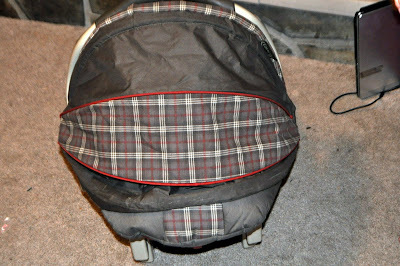 i recovered a carseat. this model carseat to be exact (hmmm, i really need to find that headrest thing, because i definitely don't have that one for ours anymore). brown and khaki and red. loved it for judah. love loved it. told myself it would soooooo work for a girl too. lied. 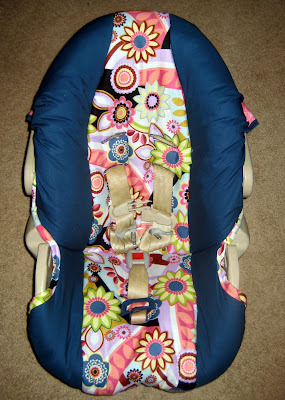 i have seen some of my favorite sewing bloggers show off their before and after's for carseat covers (check out dana's and raechel's presh handiwork) and even these sewie-mavens always seem to say that it was really hard and took a lot of work. they also never include tutorials because, hello there's like a million different types of carseats out there and because just sewing it for yourself is plenty hard enough without attempting to explain the madness to anyone else. after seeing some of these (and some way busted up failure ones on other blogs) i was determined to NEVER attempt to take this one on. 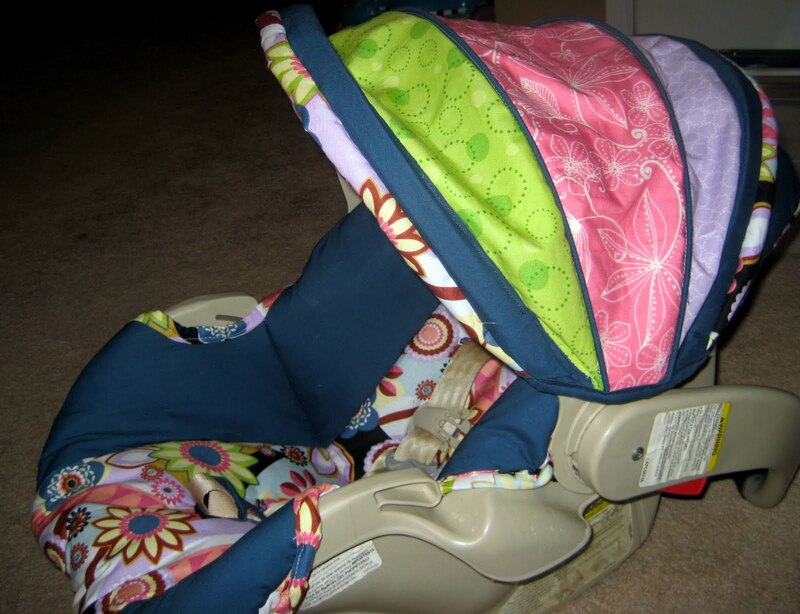 recovering a carseat became this mythical standard of sewing that i could never reach. finding out anyone had pulled it off instantly put them into the upper echelon of craftiness in my mind and left me drooling and adoring them from below. am i setting this up well enough for you? 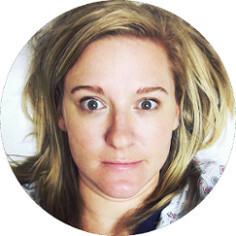 well, when we were getting all of the baby gear out of the attic, i started having a healthy dose of mom-guilt. everything was so second (or third)-hand and so judah (neither of which is a bad thing at all) that i just knew i had to spruce it up for layla. 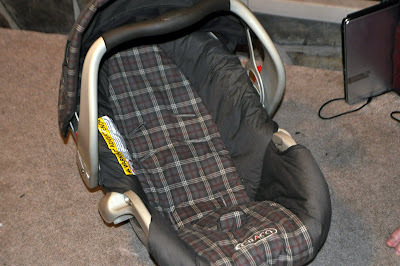 my first solution for the carseat was to just register for a new one. i wanted a new infant carrier anyway with a higher max weight limit since a lot of doctors are recommending that babies stay rear-facing for as long as possible, so i just picked out one whose upholstery was factory made for a girl. i even had godmommy lena offer to buy it for the boo as her big gift. amazing. but in the end i just couldn't do it. i couldn't waste the investment we had made in the first seat, couldn't let lena spend that kind of money (on something so boring...she is reallocating the funds into a large adorable wardrobe instead...yippee!) on a brand new one, and couldn't let myself be psyched out and intimidated by the one project that would be utterly useful in this scenario (and if she is anything like judah, she will be able to be in this old rear-facing seat well beyond her first b-day, so safety checks out too). so i grew a pair (of steel thimbles!) and dove in. 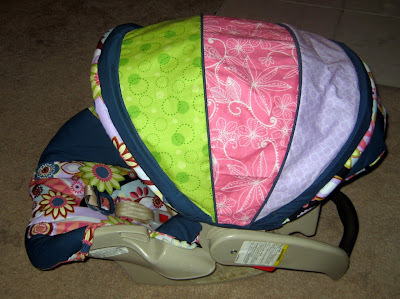 you may have guessed (because you give it so much thought) that the sunshade/canopy part of the carseat would be the hardest part. you are right, but you way underestimated just how hard. these pieces are typically triple-paneled, water resistant, and collapsible not to mention that they have contrast boning, a padded front and back, have to accommodate the plastic attachment hardware and need to be a least sort of reversible unless your idea of infant visual stimulation is letting them look at a bunch of frayed snarls of thread that are hanging there on the inside after you've patched together the outside. since i really couldn't find any reputable tutorials out there, i tackled this one totally solo. i completely took apart our existing canopy (rendering it 100% useless...we're committed now!) and tried to memorize and label every little piece and where it came from so that i could recreate it. here's where things got out of hand in the style department. i went to jo-ann to buy the fabric for this beast and just got carried away. instead of sticking to two main fabrics like the manufacturers and most other sane sewers did, i went a little crazy and got two main fabrics for the seat but then got THREE MORE different fabrics for the canopy segments. granted, they match the main floral print perfectly, but man, there's a lot going on. i can just hear nina garcia, "the construction is impeccable (well, maybe), but i just have to question the taste level" and michael kors, "these fabrics look like they were chosen by rainbow brite during a peyote binge, " and heidi, "you're out. auf wiedersehen!" so after two whole nights totaling about 5.5 hours of work (including a few extra hours where i had forgotten to add lining and nylon fabric to make it water-resistant and had to do it after the fact) i had my canopy. i took a day off because i just couldn't tackle a whole new phase of work. at the very worst, i could always just use the seat without a canopy, but the next part, cover the seat itself, was kind of a must have. once i tore up the original, there was no going back. since so much of the canopy labor was spent by me surrounded by scraps on the floor with a far off look in my eye and drool leaking from my mouth as i tried to figure out the construction, i thought, if only there was a good tutorial that i could follow so i wouldn't have to think out these details all by myself. so i gave the world wide webberkins one more try. through some miracle i found an awesome one that had some great feedback and could be applied to whichever carseat model you happened to have (although the one she uses in her example is our exact one anyway). $4 was so worth it to not have to think and just be able to follow the instructions for this phase of the project. that price even included the canopy construction and could have saved me some effort (a.k.a. drool). i used the main fabric for the padded front and back bumpers of the canopy to try to tie it together more and the main accent fabric, the blue, was the casing for the boning and plastic hardware for the same purpose. the main problem is that you can't really tell that those 3 colors (green, pink and lavender) are perfect coordinates to colors in the main floral one, and i feel like the result is just crazy psychedelic retinal assault. (though now that i realize i am missing that head-stabilizer insert thing, i can find it and recover that in some of the canopy fabrics and maybe that will bring the 2 sets of patterns together even more....or just make it even tackier). but honestly after all of my doubts and self-bashing and thinking that i would pick different fabrics if i could do it again, i am really really happy with the end result. it's totally girlie, but still has plenty of blue and green. it's utterly functional and just as safe as the factory made one (please do not try to convince me otherwise). it cost so very much less than a new seat would have yet looks like a totally new piece. and the most important: it's one of a kind and made with love (and sweat) just like the little lady whose gonna spend so much time inside this plastic capsule of safety. i'll let yall know when my graduation ceremony/trophy acceptance party is scheduled. Are you freakin' kidding me?? That is awesome! 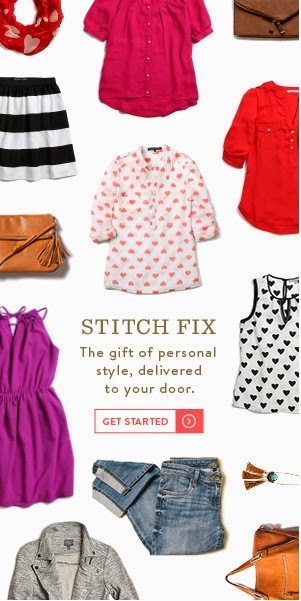 I can't believe you pulled that off- you are like a sewing super hero. Good for you. And by the way, I'm ready for Layla to be here as I know you are. It's GORGEOUS!!! I absolutely love it! You are amazing and totally deserve a black belt for that!!! Way to go!!!! That is incredible!!! You should get a snuzzler for the headrest...of course you will probably just whip one up on your sewing machine! That's sooooo awesome, girl!!! I'm super proud of you. You are my sewing hero! Ta-freaking-da, indeed! I'm so impressed by the different colored panels in the hood! I used a sojlid piece of fabric, added darts, then made casings for the boning. I bet this way would have been much better. good thinking! WOW! I'm like in aw. Wishing I could do that. i'm just scared. Great job! I like the colors. 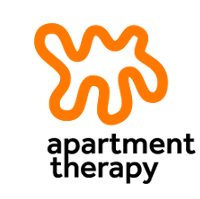 Want to recover mine? I am in shock at this goodness. I would say that you are def a sewer and a designer. THAT is AMAZING! We have a boutique store that sells Britax seats and a lady makes custom seat covers for them. She charges a pretty penny for them! When are you auditioning for Project Runway??? This is amazing, I can't believe how well made it is. I love the fabric choices too. I am sooo impressed! Great job and soooo cute! 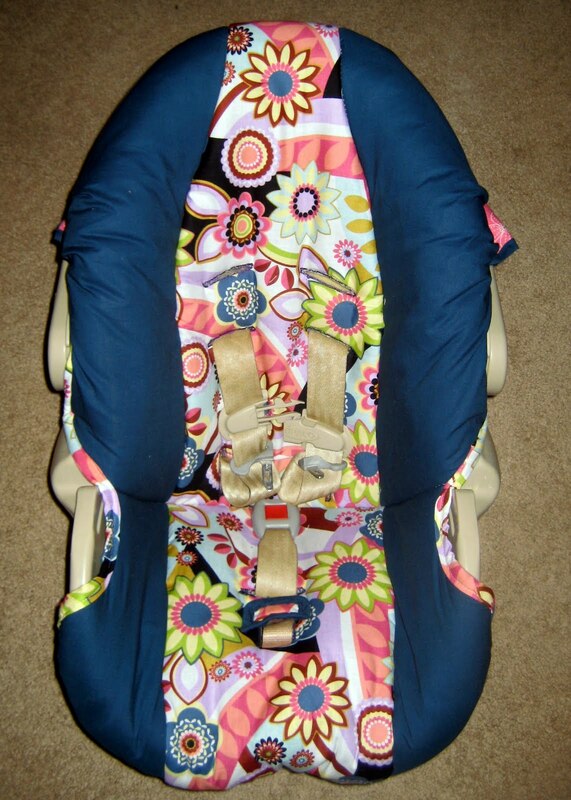 I love the fabric on the carseat!